I know you sometimes experience homeschool burnout and you don’t feel like you can continue. Your kids drive you crazy and you can’t imagine yet another full day with them. Or maybe you have some serious sibling rivalry that turns your house into a war zone. You might look at your packed calendar, your busy schedule, and your piles of work to do and not know where to begin. This homeschool job is certainly overwhelming. But always remember that it’s a blessed life. The grass is not necessarily greener on the other side of the fence. While the school bus passing by looks blissful as you think about some quiet time to yourself, know that there are many things that you are simply not missing. Ignorance is not bliss and it’s time to discuss the things I’m thankful that I don’t have to experience. 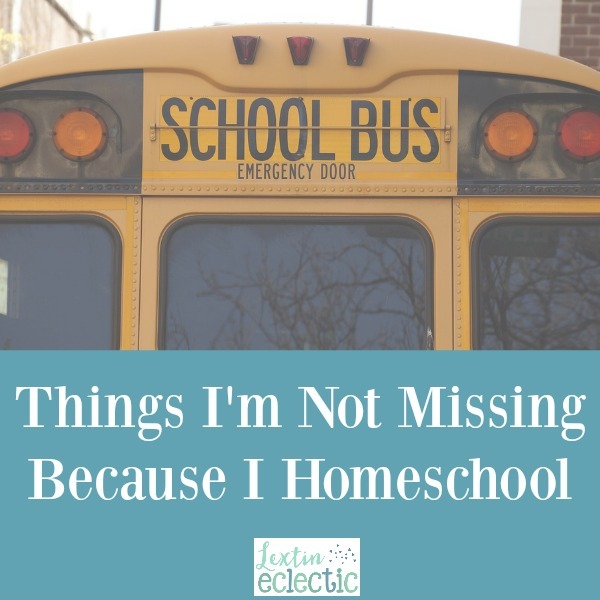 What do I miss by homeschooling my kids? Now, don’t hear that I’m bashing public school, private school, or the dedicated teachers. I’m not. I’m just telling you the things that you’re not missing. When you’re having a difficult homeschool day, you think that something, anything, has to be better than the job that you are currently doing. Know that there are difficult days for public school parents as well. There are terrible days for those teachers and those students. No matter what educational choice you are embracing in this season of life, know that each has unique challenges. Don’t waste your time wishing for something else or envying what you think you’re missing. Ignorance is not bliss; it’s important to know that there are things about public school life that you would find challenging, disheartening, and tiring. Have confidence in your homeschool choice as you begin your year. And when you have those times when you want to quit, find contentment in your choice to homeschool and refuse to focus on wishful thinking. I know my kids are not missing out on practice lockdowns or learning how a classmate does not know who his/her dad is or any other broken family situations and conversations on pop culture. Very true! I'm glad my kids won't have to experience any of that! Not counting preschool, we have been homeschooling for 3 years. My goal is to have a well rounded child that loves and appreciates others regardless of differences but above all the goal is that they love and honor God. Thanks for the reminders about what else is on the other side. Somedays I wonder but by the end of the day, I'm always glad that we have made the choice to homeschool. We've been homeschooling for five years and this year I'd like to encourage my oldest to be a more independent learner. I have been homeschooling 9 years. I am excited to try to more science, (especially hands-on) with my younger child this year. She really grasped onto it, and I am thrilled to be able to take her as far as we can with it. This is my second and a half year of homeschooling (we started in February of public school kindergarten – sure didn't last long! 😉 and my main goal is to take more time, serious time, to enjoy the process with my kids! I was a public school teacher prior to having my own little ones and am so used to checking things off the list that I really want to stop and smell the roses with them, this being one of the most beautiful things about homeschooling to me! I love this list! I literally can relate to a whole bunch of them. I wouldn't trade homeschooling for anything. Love this list! It's a great reminder. We have experienced public school, and I do not miss it for one minute. I remind myself of that every single time I start feeling the pressures of homeschooling. These are great reminders for days when homeschooling seems impossible! The grass is not always greener on the other side of the fence!